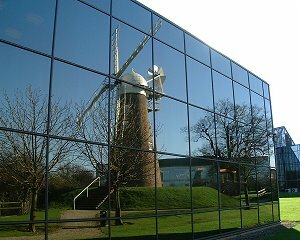 One of the first landmarks that visitors to Swindon see when they arrive via the motorway from the west is a traditional windmill which is the beautiful centrepiece of the Windmill Hill Business Park (see picture, left). Peeping out from behind the ultra-modern, glass-fronted office blocks, the windmill gives the impression that it has been there for a century or more and that the neighbouring buildings grew up around it. 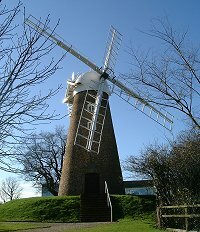 In fact, the windmill has stood on the site only since the 1980s, though its history stretches back rather further. The windmill was moved, brick by brick, from its original site in Chiseldon, where it had stood since the 1820s. In an area where there are no other surviving windmills - though the superbly renovated Wilton Windmill near Marlborough (see picture, below) is the magnificent exception - Swindon does, surprisingly, have an interesting line in windmill history. Mills were established in Britain before the Norman Conquest and by the time of the Domesday Book, in 1086, there were 197 mills in Wiltshire's 335 settlements. In those times, however, British mills were powered by water and worked either in fulling - the finishing of woollen cloth - or in grinding corn. As an agricultural county, almost all of Wiltshire's mills were concerned with the latter. It was not until the last quarter of the 12th century that wind power began to be used on a wide scale and the earliest known windmill in Wiltshire was at Ebbesbourne Wake, in the south of the county, in 1248. Highworth had a mill by 1275 and Sevenhampton by 1285, even though millstones represented a considerable investment because there is no natural source of suitable stone in the county and they had to be imported from the Derbyshire Peaks, Wales or even France. Many farms now found a new use for wind power and water-raising machinery, which is particularly useful on the edges of chalk downs where wells are deep, were in use on many farms and estates. However, although windmills would have been a common enough sight for travellers, Wiltshire saw little more than a hundred built in the next six centuries and even at the windmills' hey-day, the turn of the 18th century, as little as twenty may have been in use at any date. With the introduction of free trade in the middle of the 19th century, imported wheats were ground at the port of entry and the coming of steam proved the death knell for windmills as it offered a viable alternative power source as well as bringing the railways which made the transport of grain easier than ever before. Few windmills survived into the 20th century and those that did produced mainly animal feeds. Wilton was the last to work by wind alone, finally closing just prior to the First World War. 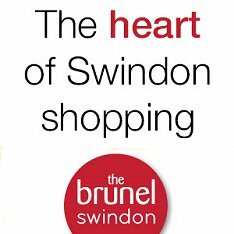 Its restoration, which began in the 1970s, has provided us with a practical reminder of buildings which once dominated the Swindon skyline. The same is now also true of the mill at Chiseldon which has found a new home in West Swindon. Believed to have been built in 1823, it stood above and east of Chiseldon church and was 22 ft, 6in in diameter at ground level. The tower had four floors with a timber stage - similar to the one now restored at Wilton - at first floor level. It is now well over a century since the sails turned. They were removed in the 1880s, though part of the inner gear still remained in the early part of this century when the building had been turned into a storehouse. In the 1980s it was bought for £15,000 and work began on moving it to its new site in Swindon. David Nicholls of Millwrights International, oversaw the operation and as work began he explained: "There are thousands of bricks and each one has to be numbered to ensure it goes back in the right place. Otherwise it wouldn't be Chiseldon windmill again." The reconstructed mill, however, encountered serious problems with damp because the wrong type of mortar - and a silicone water-repellant course made the problem worse. Finally, a specialist firm from Oxford came to the rescue, raking out the cement, replacing it with a special mortar and then repointing it. Work was finally complete in the summer of 1988. The building had already long outlived almost all of Wiltshire's windmills, including a number that stood in the town of Swindon itself. Perhaps most striking of all would have been the one in Old Town, near or on the site now occupied by the King's Arms Hotel in Wood Street, which was formerly known as Windmill Street. It survived until as late as 1867 and when it was pulled down the stone was used to build three cottages. Evidence suggests that just within sight of this windmill stood another at Okus Farm, known as New Mill, but it was destined to have a very short life. It had a dwelling house, stable, cart-shed, piggery and other buildings adjoining and is believed to have been built around 1848, but disaster soon struck and it was destroyed by fire around 1854. Its exact location is unknown. Stratton also had a windmill which was part of Kingsdown Farm in 1829. The miller was still resident in 1859 but the mill had gone by 1900. 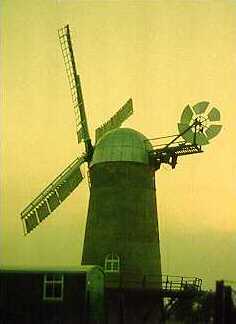 There was another windmill at Moredon, called Ridgeway Mill. Records show that it was there in the 1840s and was still standing at least until 1883. Wootton Bassett had no less than three windmills although all three appear to have gone by the early 18th century. A windmill associated with the watermill called Hunt's Mill blew down in 1781, while another near the bottom of Wood Street stood until at least 1728. Details of a third which stood on a mound at Brynard's Hill are unknown.Finally, Cricklade also once had a windmill, standing on the highest point of Common Hill, which was formerly known as Windmill Hill. The wind of change may have blown away most of the windmills that once dotted the north Wiltshire countryside, but the elegant specimen now gracing West Swindon is a fine reminder of a world that otherwise will have almost disappeared into our past.